Disappointingly old-fashioned. Nostalgia isnt enough to save this boring shooter from stagnant FPS limbo. Nostalgia is a dangerous creature, and Painkiller has been shackled to it. The result – game mechanics, enemy AI, dialogue, stereotypes, enemies – all come from embracing gaming's distant past. The result isn't as pretty as you might remember. The plot takes a particular pounding. Daniel, the grizzled hero of this remake of 2004's Painkiller, has to kill seven legions of demons so that Death will return him to his beloved Catherine, whom he killed in a car crash. He only manages 6,999 souls, so the deal's off. I'm sure that this doesn't constitute a spoiler: that's the majority of the plot. Daniel collects his souls, armed with a suitably 1990s arsenal of weapons with arbitrary limitations. Guns that fire all their bullets at once, guns that fire really slowly, crap guns with great alternative fire. This game adds one new one, a disc / leech gun, which can be used to temporarily turn enemies to your side. It's fine, but you'll still use the rocket launcher/minigun whenever you've got the ammo. The addition of co-op is minor, but makes the game a whole lot easier . When the enemies eventually chip your health down, you spend a short time as a ghost until an unspecified point when you respawn, assuming your partner is still alive. I had no problems connecting to PvE, cooperative or player vs player games – but there was substantial lag in larger levels, such as the fun park. The varied new multiplayer modes (capture the flag, team deathmatch, duel, deathmatch) are welcome, albeit totally unoriginal. Yet all the multiplayer in the world can't detract from the disastrous tedium of fighting the singleplayer enemies. When monster AI is restricted to making creatures run directly at you, and you have a spinning blade that instakills most foes, combat becomes a brainless farce. I demand that someone puts a Benny Hill tune on the co-op mode, as the thrash metal soundtrack just kills the potential humour. 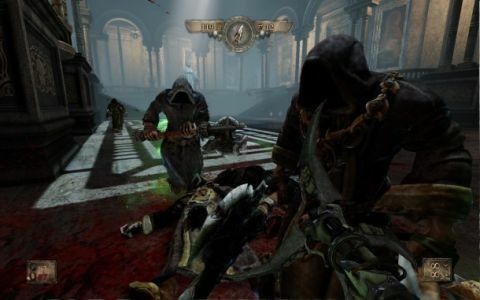 Painkiller was praised for two things: the themes of its levels, which this edition has the best 14, and the giant boss enemies, which thankfully also return. They're not as impressive as they once were, especially compared to modern equivalents in Borderlands 2 or Bulletstorm, but they're still a challenge to beat. Painkiller is a familiar game, with such a loyal fanbase, that it's sad that both have been bled white by endless expansions over the years (every time by a different developer). This latest rejuvenates the series by rebuilding it in the Unreal 3 engine, but a lot more work would be required to bring every element up to modern standards. Amazingly, there are still familiar bugs that haven't been fixed – enemies getting stuck behind obstacles being the most regular. If you want a brainless, unrefined and short shooter, go right ahead – but don't say I didn't damn you.